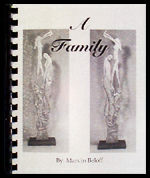 Here are a few of the books written by Wooden Bow Tie sculptor Marv Beloff. Each book is described in the paragraphs below. If you like what you read below and would like more information about the books, feel free to contact us. THE STORY OF MY FREINDSHIP WITH THE MASTER SCULPTOR"
Bill Kent was my friend. We met in 1963 when he was involved with the John Slade Ely house in New Haven as curator. He turned his back on all of his friends in 1965, isolated himself from the world and worked 24/7 for some 30 years building a body of work. He was indifferent to success or failure. We reunited in 1994 when he appeared on my TV show “Marv’s Mike.” We helped one another both artistically and health wise as we aged. He invented a new art form of monoprints, hand printed from huge, carved school board slates. I believe he was one of the world’s greatest wood sculptors and have been amazed at the quality and remarkable quantity of work he created throughout his life. He was a prolific writer of letters describing his simple philosophy of life and his frustration with the art world that rejected him. I was lucky enough to be one of the few recipients of those letters. They are remarkable and so revealing. He was a very bright man, a wonderful pianist, for me a dear friend and gifted sculptor and mentor. I will miss him! And we are all alone in our bodies. Isolated in your own way. Driven ahead to perfect the essence. Don’t count - just do! And there it is your first sculpture! And there they are many , many more! The fruit of all that beautiful effort. Your gift to the world! Until it ends - at 93! For that was your life Bill Kent. And you were happy with it! NEW! 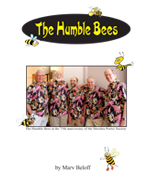 Delightful and personal account of how the Humble Bees, a Connecticut ukulele-based group, came to be. With 30 plus gigs a year, The Humble Bees are favorites at senior centers and other venues throughout Connecticut. You'll learn how none of the members had ever played a ukulele before, how each has been personally touched by the experience and how all the money they raise goes to a good cause. Also included are individual accounts from each member, a description of their typical program plus the lyrics to many of the songs they sing. Now well into his 8th decade, Marv Beloff is thoroughly enjoying being a "gigging" musician and as father to Flea Market Music's Jim Beloff and Magic Fluke's Phyllis Webb, he is a big supporter of all of their ukulele products. Foreword by Jim Beloff. 64 pages. Price = $14.95, includes postage and handling. Click here for product inquiries! A wonderful thing happened in Meriden, Connecticut on July 10th 1994. The American Silver Museum, the nation's only museum dedicated to the art, history, and science of silver and silver manufacture, was officially opened to the public. It had been more than a decade-long struggle to accomplish this and it is a story of importance. I had been at the center of this fundamentally grass-roots project from the beginning. 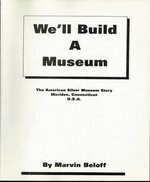 This book "We'll Build a Museum" is an inside look at dedicated volunteers, American history, political chicanery, consummate professionals, and international luminaries in the silver trade that combine to make a fascinating tale. On one level it is a Connecticut community working together to pay homage to its heritage. For more than a century Meriden has been known as the Silver City. On another level it is about local politicians who coldly put their own self-interest ahead of their community; of an immensely wealthy industry that has virtually disappeared from Meriden and neighboring Wallingford; and of visionary involvement of men and women from such acclaimed institutions as Christies and Tiffany. It is an intimate example of problems faced by volunteers throughout the country. Step by step, from beginning to end, the reader experiences the actual plan and execution necessary to create a world class museum and the incredible problem which can thwart that effort. Price = $25.00, includes postage and handling. "Beyond is Within," tells the story about a retired Emanuel who finds a way through meditation, using the unified field theory, to beam himself back in time to meet and question the great philosophers. Beginning with Socrates, Plato and Aristotle, Emanuel invests his entire being in these travels. Gradually he shares the experiences with his neighbors, North and South. Eventually he assigns his passion and insights to them. The story highlights some of the great concepts wanting in our society and is a story worth telling. On one level it is a philosophical retrospective paying homage to past genius. On another level it is about a reflective thinker who carefully devises a passage back in time. Eventually, although somewhat reclusive, he involves his neighbors in his secret experiments. Surprisingly, his journey's are echoed by a mysterious, fascinating and intriguing figure. It is an intimate example of problems faced by man everywhere. Step by step, Emanuel learns. At end, he comprehends an overwhelming obligation to share his newly acquired knowledge. The book is sparse. It is not long. It presents a glimpse of great men and concepts which ought not be forgotten. It even suggests that change in man is possible. 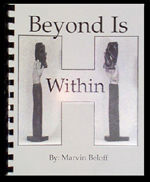 The title is derived from the idea that the reaching hand discovers - Beyond is Within. Price = $20.00, includes postage and handling. "A Family" takes place in a small Connecticut town. A proud, hard working family prospers and is content with the success of both business and the raising of three accomplished sons. The introduction of second generation spouses, however, has a remarkably unsettling effect on the stability of the family. Meet and get to know members of the clan. Learn of the deep, dark, hidden convulsive upheavals which occur. Understand why the family scars and especially those of the third generation children are so overwhelming.Compare your own family in the light of the one in "A Family" and discover much more about your own life.